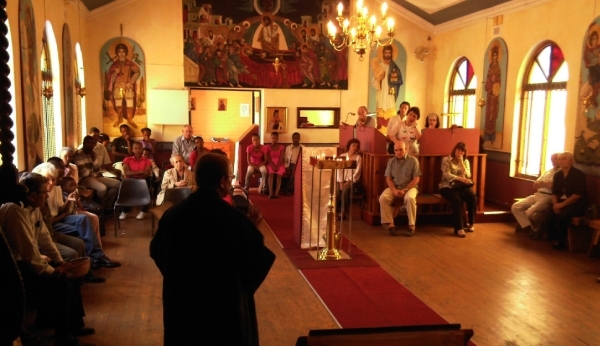 There is a woman who comes quite regularly to our church, St Nicholas Orthodox Church in Brixton, Johannesburg. She is silent, and keeps herself apart from other people. I tried to talk to her a couple of times, but she was taciturn, and didn’t say much. I asked Father Athanasius about her, and he said she stays at the Methodist Church downtown, which houses lots of refugees from Zimbabwe, where she comes from. …the Conference of the Methodist Church of Southern Africa has passed a resolution this past week asking the Presiding Bishop, Rev Ivan Abrahams, to withdraw an application to the High Court appealing against the arbitrator’s decision, in the matter between the Presiding Bishop and Rev Paul Verryn regarding his suspension in January. Every Friday night at 7pm at the Central Methodist Church, there is a refugee meeting. When I began my research in April this year, I planned to attend one of these meetings. My expectation was to meet in a conference room around a large table with about twenty people. I was so wrong. The first meeting I attend is on a chilly April evening. At the entrance of the five-story Church building, women sit behind low tables – selling chicken and spinach, pap and gravy, sweets, snacks and coffee. In the sanctuary on the first floor, over 500 people are waiting for the meeting to start. Central Methodist is a visible and continuous reminder of many challenges we face in our society and in our city – poverty, migration, xenophobia, policing, inner city housing and shelter, the vulnerable position of women and children, the gap between rich and poor. It’s not just about one city, or one group of homeless people. These things are happening all over the world. Homelessness is a problem in many countries and many cities. Refugees can be found in many places, and, along with them, xenophobia. This post is part of a synchroblog, in which several bloggers wrote on the same general topic and then link to each other’s posts so you can surf from one post to the other and read several different view points. This month’s theme is “Marginalised people”.